One of Vernon’s main attractions is the climate, which is slightly more temperate than other Okanagan locations. While the city still experiences all four seasons, they tend to be a little more elastic. When it is time to snap into snow, call for our Vernon snow removal and salting. The city itself sees some snow, with an average of around 95cm falling annually over approximately 40 days. This may not seem like much in comparison to other Canadian cities, but B.C see its fair share. Winters here see an average daily high of around freezing. Rainfall followed by a drop in temperature can provide ideal conditions for slip and fall incidents. Generally, the consequences of these are minor bumps and bruises. Nonetheless, many result in more serious injuries requiring hospital admission. Here, at Gorilla Property Services, we offer our Vernon Snow Removal and Salting programs for our Strata and Co-Op clients exclusively. Starting in December and running until March, our main objective is to allow safe access to your property all winter long without you ever having to check the weather forecast. Awareness is essential when implementing effective salting and snow removal. 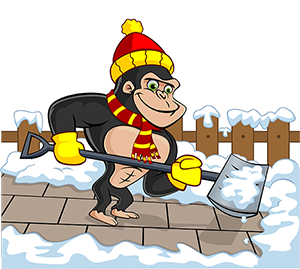 When you call in Gorilla Property Services, we guarantee salting of all exposed common areas will be carried out meticulously the night before a temperature, frost warning and/or light snowfall. Gorillas perform shoveling and snow removal for a predetermined snow fall level. We even offer parking lot salting with the aid of our trusty ‘Gorilla Mobiles’. Gorillas take ‘before’ and ‘after’ pictures of every service and sent same day to the Property Manager and/or Council for their records. We’ll make sure the job’s done right while you’re in the land of nod.